Don’t assume that because you and your business partners have ‘an understanding’ of what would happen if one of you was incapacitated, that that understanding would be respected in law. A Commercial or Business LPA is an essential part of Business Continuity Planning. 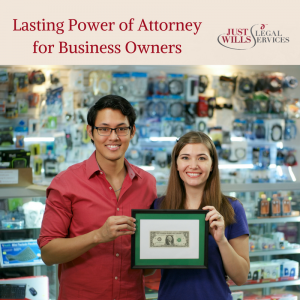 Although you may have made an Estate Plan, and even a Business Succession Plan, if you don’t have a Lasting Power of Attorney specifically design for your commercial interests, your company could be at risk. When would I need a Business Lasting Power of Attorney? • subject to a medical condition that affected your decision making capability? Even if you already have a Lasting Power of Attorney in place to protect your family and enable them to make medical and financial decisions on your behalf, would your spouse/parent/adult child welcome the responsibility of taking on your business – particularly at a time when they are likely to be under a great deal of stress (if you are ill or incapacitated). A Financial Lasting Power of Attorney for Business is the legal document that must be created and properly registered (with The Office of the Public Guardian) if you are to secure your business in any eventuality. Once you have set up a Financial LPA for your family, enabling them to access family finances if you are incapacitated, it is advisable to set up a separate Financial LPA to empower the person you would want making business decisions on your behalf, if something happens and you cannot. What happens without a Business Lasting Power of Attorney? Without an appropriate Business or Commercial LPA in place, interested parties would have to apply to the Court of Protection to appoint someone to act on your behalf, which can take several months, not to mention thousands of pounds in legal fees. The person appointed may not be the person you would have chosen – and your business may be unable to operate properly for months on end. Could your company survive such an event? • Who has authority to pay bills/sign cheques/release salaries? • How many company directors are required to make company decisions? • Could business loans or accounts be frozen if one of the company directors is unavailable? • Are any personal assets (ie, your house, or your business partners house) secured against business loans? Could they be endangered if there is no plan in place? • Who deals with your insurance companies, files your company tax returns, etc.? Under the terms of your Business LPA, you can specify who can act on your behalf on different matters; you may appoint several people – legally called ‘attorneys’, although they are not necessarily legally qualified persons – that you trust, to all work together, or to work on different decision making areas. These attorneys may be business partners, or family members, or a mixture. You may want them to take decisions jointly in certain cases, but have the freedom to take decisions independently in others. Once you start appointing attorneys to work together on some areas, but not others, it becomes extremely complex and you will certainly need expert legal advice. If you’d like to book a free consultation with one of our legal experts across the UK, book online or call 01342 477 102 and quote ‘Business LPAs‘.